The major difference between a furnace and a boiler is the medium used to distribute heat. Boilers use water or steam, while furnaces use warm air. Furnaces can heat the air with any number of sources, but the most common are gas, oil and electricity. There are two primary types of hot air systems: gravity and forced air. In gravity systems the air travels upward naturally because it is lighter than the surrounding cooler denser air. It travels through ducts into the home. Forced-air systems accomplish the same task, but use a fan to push the air. They also allow more flexibility than other systems. For one thing, humidifiers can be placed in the system to add moisture to the air and cooling units can be added to distribute cool air. If you're considering adding a cooling system to an existing forced-air furnace, note that larger ducts are required for cooling than for heating. This is because there is less of a temperature difference in cold air so the system needs to move more air. Conventional gas furnaces come in many sizes (ranging from 45,000 to 125,000 BTUH and larger). They can be installed or mounted in many locations. The most common placements are horizontally in the attic or vertically in the basement or utility closet. Keep in mind that the unit's location may be restricted by venting requirements. Venting has to be installed to move the products of combustion from the furnace to the outside. The efficiency of standard gas furnaces is measured by its Annual Fuel Utilization Efficiencies. AFUEs range from 60% to more than 95%. 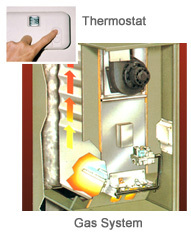 First, a thermostat calls for heat which signals the heating system to activate. In an electric furnace, this starts the flow of electricity to the heating elements. In an oil system, the oil pump begins pumping oil from the storage tank to the burner where it is atomized and ignited. In a gas system, the thermostat signals the main gas valve to open releasing gas into the combustion chamber where it mixes with air. In gas systems with pilot lights, the air/gas mixture is ignited by the standing pilot. In intermittent ignition systems, when the main gas valve is opened, an electronic ignition device ignites a pilot light which in turn ignites the gas/air mixture. 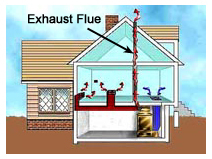 In gas, oil and other combustion systems, the heat contained in the by-products of combustion pass around a heat exchanger and exit the home through a chimney or exhaust flue. It is in the heat exchanger that the heat is transferred to the air which will be ducted to the conditioned space. 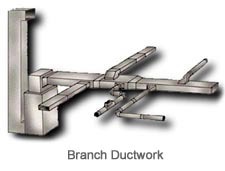 Electric furnaces have no combustion by-products and therefore require no chimneys or vents. The same air that passes over the heating elements moves directly into the home. When the temperature of the air that has just passed through the heat exchanger reaches a pre-set temperature, usually between 90 and 120 degrees, a thermostat in what is called the plenum activates the blower fan. The blower fan draws air across the heat exchanger warming it and distributing the warmed air to the home. When the room thermostat is satisfied, it deactivates the heat source shutting off the electricity to the heating elements in an electric furnace, turning off the oil pump in an oil system and shutting off the main gas valve in a gas furnace. The furnace blower will continue to operate until the air temperature in the plenum drops to the fan switch-off setting. The furnace will remain off until the room thermostat once again calls for heat. Ductwork carries the air heated in the plenum to the room vents. Cold air return vents are usually near the bottom of interior walls to provide more uniform temperatures. They should be as far from the supply vents as possible.